Among the largest Asian art museums outside of Asia, the Musée Guimet houses thousands of artifacts, including sculptures, paintings, porcelain, and scrolls that date back more than 5,000 years. The museum was founded by adventurer and industrialist Émile Étienne Guimet and features several temporary exhibitions each year. Part of the Musée National des Arts Asiatiques (alongside two other Paris institutions: the Hôtel d’Heidelbach and the Musée d’Ennery), the Musée Guimet opened in Lyon, following Guimet’s travels in the Far East. After moving to Paris in 1889, the collection grew to include a broader range of exhibits. 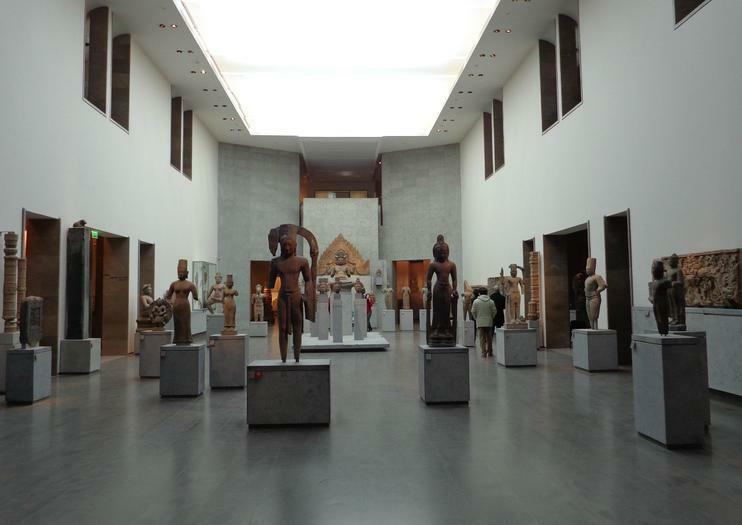 The Musée Guimet is conveniently included in the Paris Pass and Paris Museum Pass schemes, each of which can save travelers time and money on sightseeing. All ticket purchases at the Musée Guimet entitle you to a second visit within 14 days of the original visit. On the first Sunday of each month, admission to the museum is free. The Musée Guimet offers an on-site restaurant, bookstore, and shop. The museum is fully accessible to visitors with limited mobility. Located in Paris’ elegant 16th arrondissement, the Musée Guimet can be reached by numerous forms of transportation. Take Métro line 9 to Iéna, located just steps away. The museum is also served by bus Nos. 22, 30, 32, 63, and 83, and can be reached by taxi, Vélib’ bike, or on foot. The Musée Guimet is open every day but Tuesday. The museum is closed each year on Dec. 25, Jan. 1, and May 1. The Musée Guimet hosts a number of workshops throughout the year, which range from origami and calligraphy classes to lessons in ceramics, as well as family classes and activities. The Hôtel d’Heidelbach, part of the Musée National des Arts Asiatiques – Guimet, hosts Japanese tea ceremonies throughout the year. Savor the world-class art offerings of Paris while avoiding the long entrance queues with the Paris Museum Pass. Choose from a 2-, 4- or 6-day pass, and enjoy unlimited, skip-the-line entry to more than 60 museums and attractions in Paris and surrounds. Also included is a 1-hour sightseeing cruise along the famous Seine River. Get a new perspective on riverside landmarks like the Eiffel Tower, Louvre Museum and Notre Dame while relaxing aboard a specially designed touring boat.